Tree straps: Our hammock set contains two tree friendly straps, it could protect our tree and avoid the damage caused by rope. It values 10. Carabiners: The edge of our Carabiners are flat and smooth, but others are sharp. The sharp edges may snag your hammock or ropes. Price: Our double hammock price is only 24.99. Material And Processing Characteristics： The hammock is made of super strong 210T parachute nylon material. So it's very lightweight. This soft, breathable and mildew-resistant nylon cloth will last for a long lifetime. We have employed high-grade nylon triple interlocked stitches to maximize hammock strength for your ultimate safety. So the hammock are tested to hold up to 500 pounds. Way Too Easy Money Back Promise ：Our promise is that our product is just as great, better or the best out there and we back it with our crazy promise. If you are are unsatisfied with our hammock, you could contact us and tell us your reason, then we will give you your money refund within 5 hours and you can keep the hammock. Click 'ADD TO CART' now to Start Your Adventure! 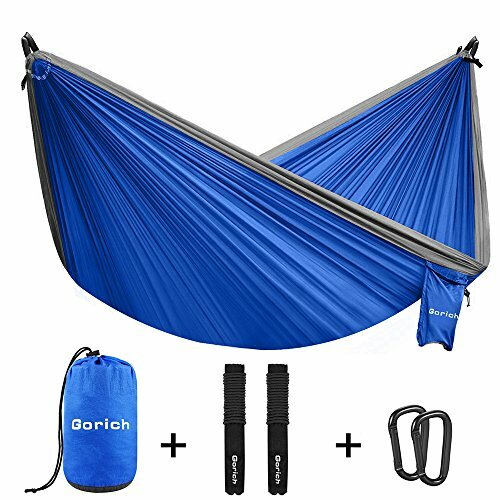 Comfortably Supporting Up To 500 lbs-Gorich double hammock are made of high quality heavy duty 210T parachute nylon (the same kind skydivers use!) This extra soft yet super strong material gives you the most comfortable and relaxing experience ever. If you have any questions about this product by Gorich, contact us by completing and submitting the form below. If you are looking for a specif part number, please include it with your message.